Citi Field, which replaced Shea Stadium as the New York Mets’ home ballpark in 2009, has hosted three no-hitters. The first is without a doubt this site’s favorite. 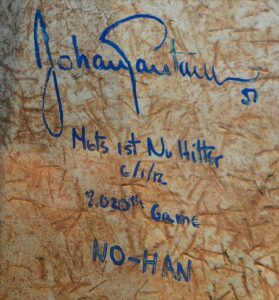 Johan Santana’s June 1, 2012, no-hitter against the St. Louis Cardinals broke the Mets’ 8,019-game streak of not throwing a single no-no since the club’s entry into the National League in 1962. The other two, which clearly are not our favorites, were thrown against the Mets by the San Francisco Giants’ Chris Heston and the Washington Nationals’ Max Scherzer.